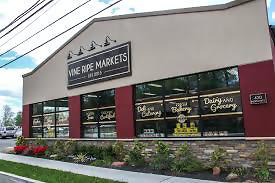 Vine Ripe Markets is your one stop convenient shop that offers the finest produce, fresh cut meats, deli, seafood and much more. We specialize in prepared gourmet meals, fresh baked breads and cakes as well as organic and local produce and grocery items. In addition, we have a full grocery, dairy and frozen department to be your one stop convenient shop. Our deli department is #1: we carry a wide variety of imported and domestic items as well as a full line of Boars Head products. Stop in today and sample our world famous fresh mozzarella or our delicious storemade meats. Our staff is attentive and knowledgeable and will go the extra step to enure you get the best experience possible.